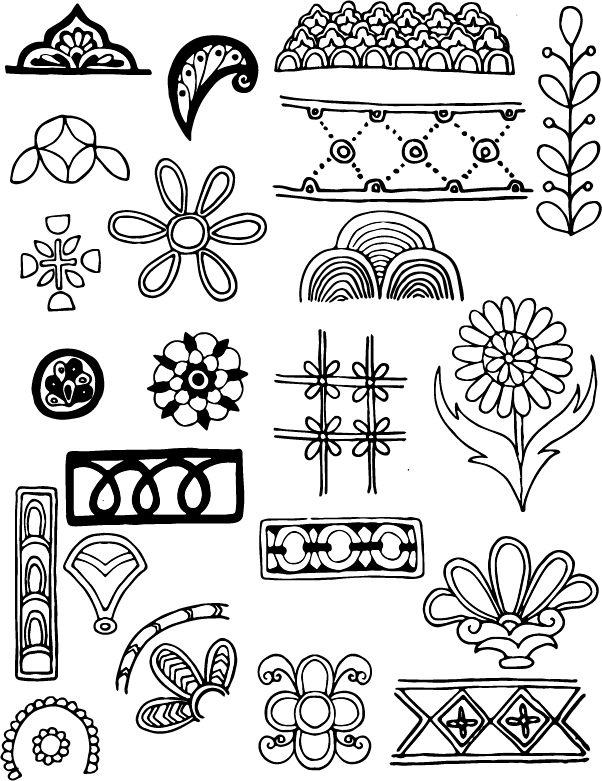 Here I am again, this time with a collection of 23 doodles derived from ornament design found on pottery and textiles from long ago. I am often inspired to sketch while visiting museums, particularly while visiting exhibits celebrating art from Egypt, Turkey, India, and South/Central American countries. I bring you these “doodles” in raw form. I am doing this on purpose, as I want to free your imagination. In future blog posts, I will modify and combine these items in forms that will add beauty to art journaling pages. 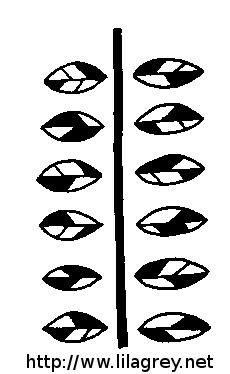 These are just little shapes that can be repeated and combined in countless ways. This post is long overdue – though I have been drawing doodles every day, I have not been keeping up with the posts! So, in order to catch up, I will post these doodles in “batches”. That’s not so bad, this way you get a lot of ideas in one post! First of all, why have I not posted for a while? Well, I had a few fabulous projects to work on (including a brand new coloring book! ), and I needed every minute to meet the deadlines! I am super excited to get back to you with my art journaling doodles. I hope you enjoy them and that they inspire you to journal. This funky fall leaf is part of my black and white fall leaf series. These were inspired by a walk in the neighborhood last fall. I had to get these drawn before the leaves I collected disintegrated! 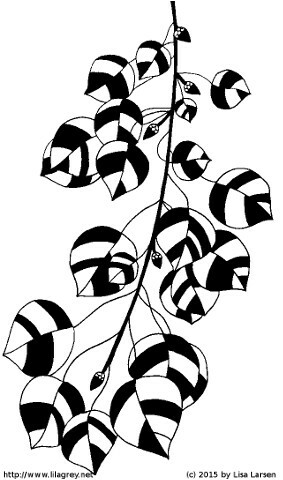 This bunch of aspen leaves (also part of the fall leaf collection) is an illustration from my Aspen tree. I just loved the little berries hanging out between the beautiful leaves! This little branch is a reminder of how we can play with shapes and fills to create a whimsical image that reminds us of something we love. Oops! I deviated from my leaves! 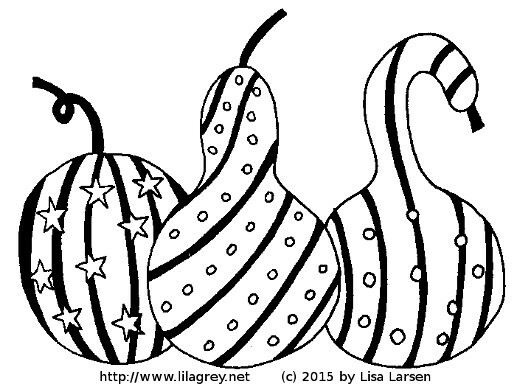 I thought these carved gourds and pumpkin would be a fun little decoration on a corner of a fall journal page. 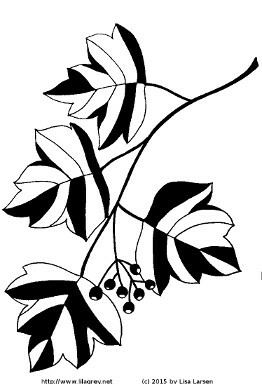 More fun leaves with berries! 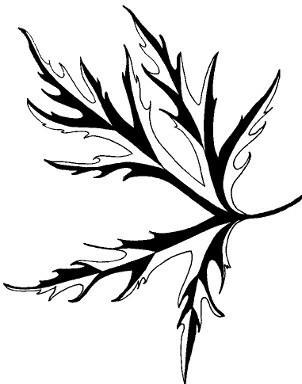 This abstract branch would make a great divider or border on an art journal page! Lastly, here is a teaser for things to come. I started thinking of some fun patterns I could use not only for journaling, but also for patterns in coloring books for adults. 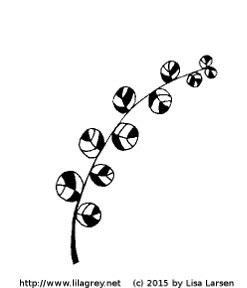 In the next posts, you will see some studies of ethnic inspired patterns. I hope you found this post interesting and hopefully inspiring. This is a super easy little border made of half-flowers! You can space them apart, stick them together, wrap them around the page, or simply use it as a divider. 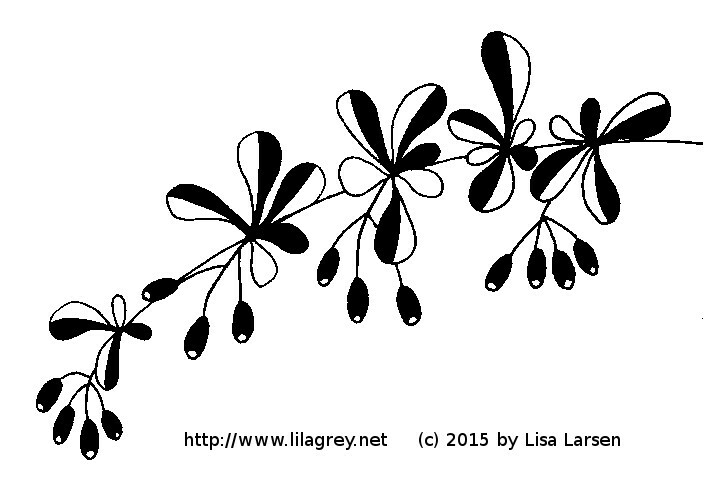 There are many possibilities with this little freehand pattern.